Winter Storm Cara has already has dumped over a foot of snow in parts of the West and still has a mess of snow, sleet and freezing rain in store for the West and Plains that could snarl Thanksgiving holiday travel. A textbook combination of Arctic air plunging south and tropical moisture surging north will set the stage for freezing rain across a swath of the southern and central Plains over the next few days. In some areas, accumulating ice will create dangerous driving and walking conditions and may even be enough to cause a few spotty power outages. 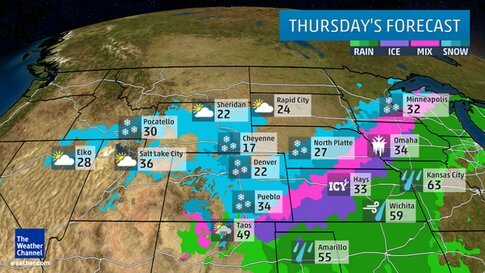 Numerous watches, warnings and advisories for winter weather are posted across a swath of the West, Plains and Upper Midwest. A cold front and accompanying upper-level storm system continues to carve through the Rockies and Four Corners Region, squeezing out snow even at relatively low elevations. As we've seen already, snow may even accumulate on some valley floors. This system will then direct its energy and moisture into the Plains through Thanksgiving Day and continuing into much of the holiday weekend, bringing a mess of snow, sleet and freezing rain, not to mention heavy rain. As if this weren't enough, strong arctic high pressure will also move in allowing the first real blast of arctic air to surge into the U.S. The coldest air mass of the season to date is expected for the West and the Plains during the holiday weekend. Although the heaviest snow has likely ended, periods of light snow and snow showers should persist across portions of the Intermountain West and central to southern Rockies through Thursday and Friday. This map shows additional snow yet to fall from now through the end of the event and does not include snow that has already accumulated. Blizzard warnings continue through Thanksgiving Day over portions of Sweetwater County in southern Wyoming, including a stretch of Interstate 80 through Rock Springs and Green River, as stronger winds accompanying the snow and arctic cold front could lead to areas reduced visibility in blowing and drifting snow. This is particularly of concern over ridgetops and mountain passes. On Thanksgiving Day, the Western snow will fade to just lingering pockets over the high country of Colorado and the adjacent High Plains westward into northern Utah and northeast Nevada. Snow levels will remain low through the West, with accumulating snow expected in more populated areas compared to the last few winter storms, including parts of the Snake River Valley of Idaho and northern Nevada. For those traveling for Thanksgiving, be ready for winter driving conditions on Interstate 15 in Utah, Idaho, and Montana; Interstate 80 in parts of California, Nevada, Utah and Wyoming; Interstate 84 from north of Salt Lake City into Idaho and Oregon; Interstate 90 in Montana; and Interstate 70 in Colorado. 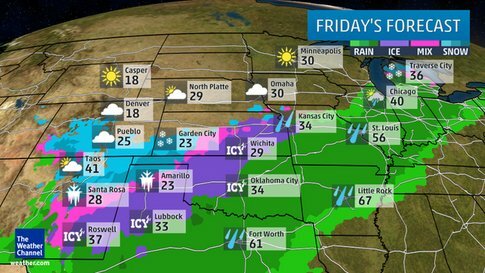 Arctic cold air will plunge south into the Plains through Friday. The shallow layer of below-freezing arctic air near ground level will slide underneath a large plume of warm, moist air from the Gulf of Mexico, setting the stage for a wintry mess of freezing rain and sleet just in time for Thanksgiving, Black Friday, and the rest of the holiday weekend. 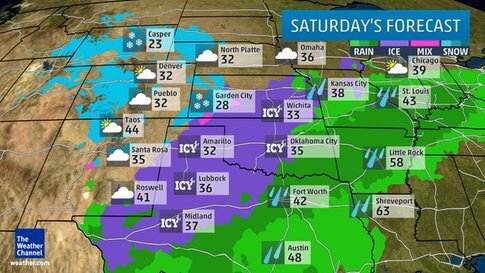 As a result, the National Weather Service has issued an ice storm warning for portions of the Texas and Oklahoma panhandles, including the city of Amarillo, Texas. These warnings are valid from Thursday night through midday Saturday. Those warnings are just part of a zone where freezing rain and sleet are expected to occur. That zone extends from parts of Iowa and Nebraska into northern and western Kansas, the Texas and Oklahoma panhandles and northeast New Mexico. Where the cold air manages to dislodge the warm layer just above ground level, any precipitation will change to plain snow. Overall, freezing and frozen precipitation is expected from Thanksgiving Day through Saturday, from the southern High Plains to the Missouri Valley and northern Great Lakes. Most roads will become icy and hazardous. The first to ice up will be untreated roads, bridges and overpasses. Furthermore, precipitation may begin as rain in some of these areas, followed by the arctic front, which could cause flash freezing on roads, even before freezing precipitation begins. In a few areas, some limbs or trees may break, and some power outages may result. However, we do not expect the level of ice accumulation and wind to produce widespread downed trees or widespread multi-day power outages. This is partly due to the potential for precipitation types to change from freezing rain to sleet, perhaps to snow, rather than many hours of freezing rain over a large area. In addition, much of the affected region lacks significant tree cover outside of trees planted in cities, towns and as windbreaks between farm fields. As a result, long-distance power lines aren't at risk from falling trees and limbs the way they are in the East. The pure weight of ice or the combination of stress from ice and high winds can still damage power infrastructure outside of cities in the Plains, but this storm is unlikely to bring intense enough conditions to do that. For now, any snowfall amounts from the Plains to the Upper Midwest and northern Great Lakes are expected to be light to moderate. (Translation: It may be wet snow, but widespread 6-inch-plus amounts, as from Winter Storm Bella last weekend, are not expected). If that weren't enough, ahead of the cold front, rain and thunderstorms are expected and locally heavy rainfall will bring the threat of flash flooding from Texas to the Midwest. The upper-level trough, or southward dip in the jet stream, will dive across the West and combined with a strong area of high pressure from Canada, the result will be the first blast of arctic air arriving in the West and Plains. Low temperatures will be up to 25 degrees below average in interior portions of the Pacific Northwest and Rockies Thursday and Friday mornings. Overnight lows will range from single digits to well below zero in the northern and central Rockies beginning Thursday morning and lasting until Saturday morning. This will lead to the coldest temperatures so far this season for many areas. A couple of examples include Helena, Montana, where the lowest temperature recorded so far this season had been 14 degrees on Nov. 21; Helena fell to 13 late Wednesday morning, and lows there are expected to drop to the single digits the rest of this week. Reno, Nevada has seen the mercury drop as low as 21 degrees on Nov. 11; lows in the teens are in the forecast Friday and Saturday nights. Temperatures are expected to drop into the upper 30s at the San Francisco International Airport late this week, and a new daily record low may be threatened on Friday morning (current record is 37 degrees). Wind chills may plummet to the teens or 20s below zero in parts of western Wyoming Thursday night. High temperatures will remain very cold as well. Highs will be 10 to 30 degrees colder than what is normally expected for the end of November over parts of the Rockies and High Plains on Thanksgiving Day and Friday, while highs 10 to 20 degrees below average will persist over Nevada and parts of neighboring states. Highs will only reach the teens and 20s in parts of the Rockies, with 30s and 40s for the Pacific Northwest and Great Basin. Other top totals by state as of 4 p.m. MST Wednesday include 8.5 inches near Clancy, Montana; 4.5 inches near Republic in eastern Washington; and 2 inches in Naples and Burley, Idaho. 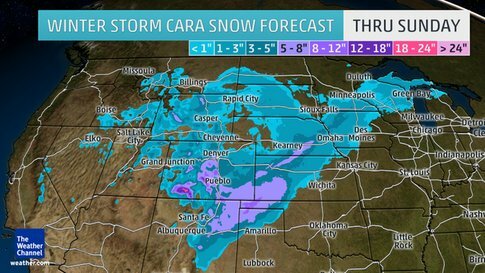 Check back for updates and the latest information on Winter Storm Cara. The name Cara (CAH-ruh) is taken from the Latin word meaning "beloved."